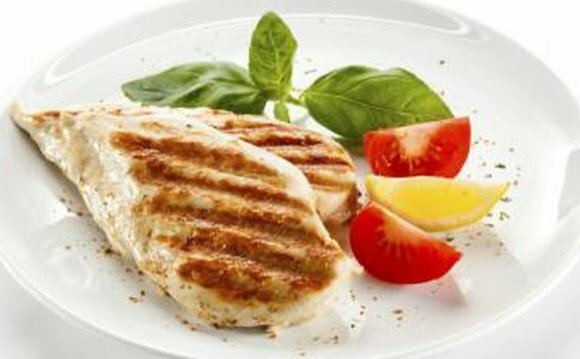 Use a low-calorie, high-protein approach to get lean. For most of the year, a bodybuilder's diet is a high-protein, high-calorie one, as this helps to build muscle mass and strength. As you approach a competition, however, you need to reduce your calorie intake to lose fat, yet still keep your protein intake high enough to preserve muscle mass. When starting out on a high-protein, low-calorie diet there are several tips and tricks you can use to help things run smoothly. Keeping your protein intake high when dieting is vital for maintaining muscle mass, according to pro bodybuilder and nutritional scientist Dr. Layne Norton, who recommends a daily protein intake of between 1.2 and 1.6 grams per pound of body weight when dieting. Nutritionist Lyle McDonald backs this up by writing in "The Rapid Fat Loss Handbook" that when your carbohydrate intake is lower, as it almost certainly will be on a low-calorie diet, your body can start burning muscle mass for energy, but boosting your protein intake will prevent this from happening. While adequate protein intake is crucial, you won't lose fat unless your calories, carbs and fats are in order, too. Norton recommends consuming between 13 and 17 calories per pound of body weight each day. Each gram of protein contains four calories, so multiply your protein intake by four to find your total calories from protein, then take this figure from your overall caloric intake. This is the amount of calories you're left with each day to consume from carbs and fats. Track your calories using a tracking app or look for information on food packaging. Base each meal around a lean protein source to keep your protein intake high without overdoing the calories. Chicken and turkey breast, egg whites, cod, tilapia, canned tuna, low-fat cottage cheese, tofu and skim milk all provide protein with minimal carbs and fats. Fill up on vegetables, too, particularly dark green leafy and brightly colored ones. Spinach, kale, broccoli, asparagus, zucchini, onions, mushrooms, peppers, carrots, lettuce and cabbage are all good choices. If you have any carbs and fats left over, then add in other items such as grains, fruit, nuts and oils. A sample plan could be an egg white omelet with vegetables and low-fat cheese for breakfast, a grilled chicken salad with chickpeas for lunch and a lean sirloin steak with mixed vegetables for dinner. Add in snacks such as protein shakes, cold meat and low-fat yogurt between meals if needed. Feeling slightly irritable, along with a foggy head are two common side effects of low-calorie, low-carb dieting, notes trainer Shannon Clark on Bodybuilding.com. You may also find your workouts start to suffer as you lack strength and energy. If this is the case, increase your calorie intake by adding small amounts of carbs and fat, but keep an eye on your progress - if you start to gain body fat, you're eating too many calories. Always consult your doctor before starting on a low-calorie, high-protein plan.